I just reviewed Cold Blood Brew by Tonya Kappes. She is one of my favorite authors. With her wonderful humor and quirky characters, her books keep me in stitches. This is my review on Goodreads. 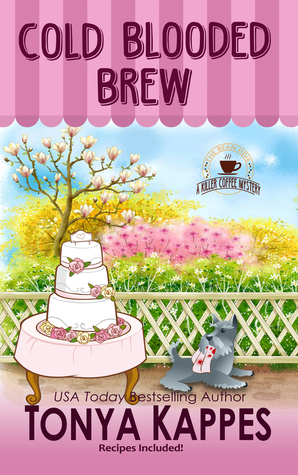 Cold Blooded Brew by Tonya Kappes is the fourth book in the Killer Coffee Mystery series. The Bean Hive is owned by lawyer turned coffeehouse proprietress Roxy Bloom. It's where the people of Honey Springs, Kentucky meet for a coffee or tea, something to nosh on and to catch up on all of the town's gossip. Roxy, with her best friend and lovable dog Pepper, must find who killed the maid of honor and best friend of the bride. Tonya Kappes always seems to make her readers feel like a part of her small town. She draws you in with wonderful characters and her story plots. When I'm reading about The Bean Hive, I feel like I'm there listening to the conversations while enjoying a coffee. I want to visit all the shops. This book is a great edition to this series. I had a hard time putting it down. I wanted to keep reading until the end. It kept me engaged in the story and trying to figure out who dun it. Once again Tonya kept me guessing until the end. I also liked that she includes the adoption of animals in this series. I would recommend this book to anyone who likes a cozy mystery that has humor, wonderful small town characters, and a story that keeps you involved until the end. I received this ARC copy of this book to review from the author. This is an honest review. Goodreads is a great place to read and connect with others to see what they think about books.